Unarguably explosive. Unquestionably talented. Straight up cool. 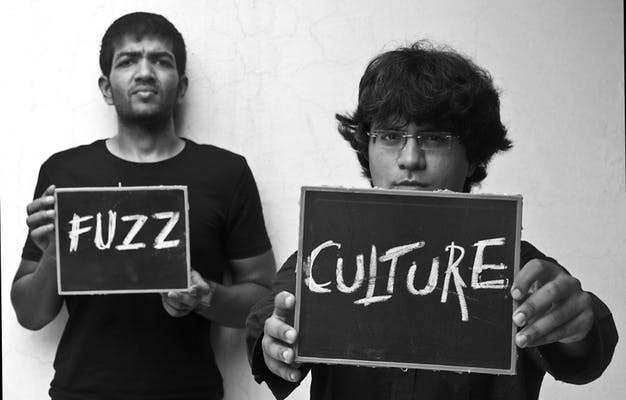 FuzzCulture… one of the newest and most energetic acts in Delhi, if not in the country, at the moment. The first time I heard them was quite by accident actually. They were doing a gig back in the TLR days and I happened to stroll in. I never did make it to the table a few friends had captured. Srijan and Arsh have been involved with making music for years now and besides playing with incredibly accomplished bands like The Circus, Parikrama, Cyanide and others, their project FuzzCulture sounds nothing like anything else they’ve done. There is a distinct and recognisable sound that they have created and it will blow your mind. Having a signature sound is always a great thing, especially considering that they’re brand new… I just hope the sound continues to evolve over the years. FuzzCulture has released their first EP called Indulge.Divulge. It is brilliantly put together and the title track plays on the radio now every now and then too. FuzzCulture are doing a set at NH7 Weekender this weekend in Delhi. They are scheduled to play earlier in the day, so make sure you get there in time so you don’t miss it. They are playing about the time the afternoon drinks start kicking in, and will make sure you use all that extra energy constructively! The track featured here is called Midnight Delinquents and it’s one of my favourites of the EP and, as it happens, it is also Arshs’ favourite track on the album. What’s the inspiration behind the track? None… it just sounds brilliant and thats all that matters to them. So there is no pretentious story about inspiration that filtered through clouds and sunlight and then hit them while walking around some obscure mountain looking for themselves. Just how we like it! Check out their Soundcloud page here, and Facebook page here.